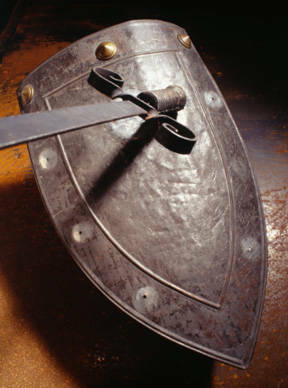 I Am your shield and your rear guard, says the LORD. The enemy in front of Me cannot get past me to touch you. I said, touch not My anointed and do My prophets no harm. I Am the One who makes you untouchable and undefeatable. The enemy that is sneaking up from behind will not overtake you or overwhelm you either, for He will only meet up with Me. He will be in derision as I laugh at him and cause his wisdom to be foolishness. I will cause his plans to be foiled every time and make his counsel weak and powerless. Nothing frightens Me and I cannot be intimidated with any strategy of the wicked one. I Am undefeatable every time and nothing takes Me by surprise. I Am always prepared for the battle and ready to defend you, says the LORD. Troubled on every side is not My way of punishing you, says the LORD. I did not call for troubles but will make you a victor as you valiantly prepare for battle. Be not afraid with the size of the enemy, for I Am with you. The army of My heavenly host is dispatched to war for you, says the LORD. Fear is not for My brave, called out ones. Be bold and strong in Me, for you will not be destroyed by the enemy. Your enemies are my enemies and I cannot be defeated. I will fight against those who fight against you. I will bless those who bless you, and I will cause you to be built and blessed and protected by Me, says the LORD.